Happy Melbourne Cup Day! If your not Australian, this is one of the biggest days in horse racing history, and one of the biggest events on the Australian calendar. Every year, at 3.00pm, every body tunes in for the “race that stops the nation” to see who will be the Melbourne Cup champion for the year! If you are anybody, you are at the races for a day of fashion, champagne, betting and horses and if your the creme de la crop of anybody you are at ground zero in Melbourne where all eyes are you! 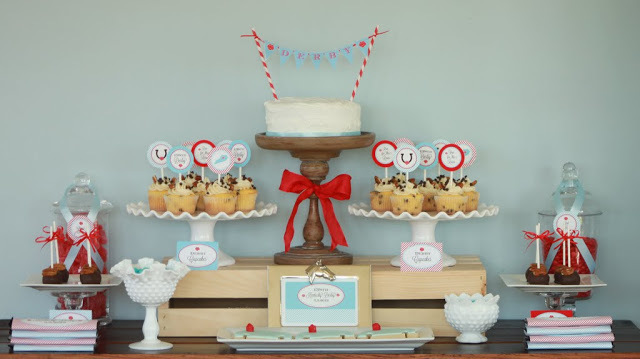 If your planning on throwing a Melbourne Cup day get together, or need a sweet theme for a fancy, high tea garden party, why not throw a Melbourne Cup themed party? Here are some great ways to do just that. Go for the class and have a garden party theme with the horsey touch to it. Set beautiful white or wood tables outside for guests to be seated at and use as the buffet. Use vases of flowers as centerpieces as well as lace towers of cupcakes, white pillar candles, teacups, glasses and vases, birdcages and flag bunting. Pastel colours are a beautiful way to convey the garden party touch, while being both subtile and a great way to stand out amongst the lush greenery of your garden. 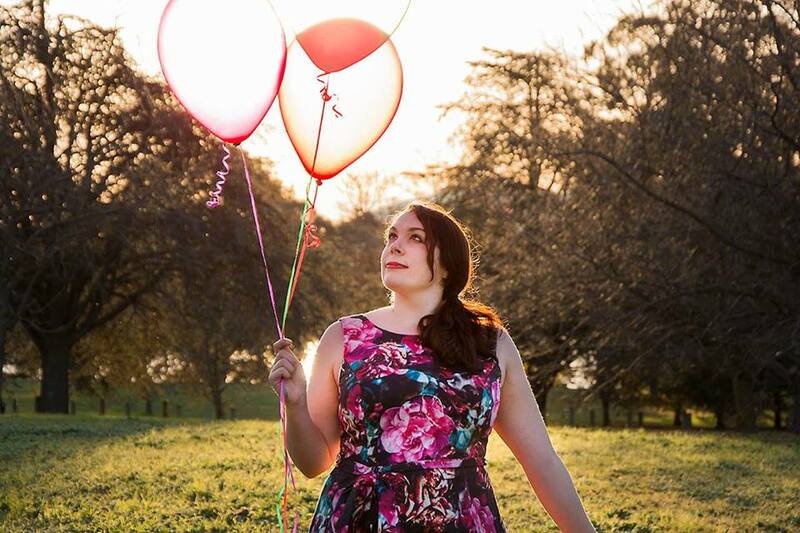 It also goes along with the fashion and idea of a spring fling that usually is associated with the Melbourne Cup. You can add the horsey element by adding in silk and shiny materials as bunting, pillows or flags to represent the colourful uniforms that the jockeys all wear. Use horse patterns on napkins or ring holders and decorate with some steel horse shoes. 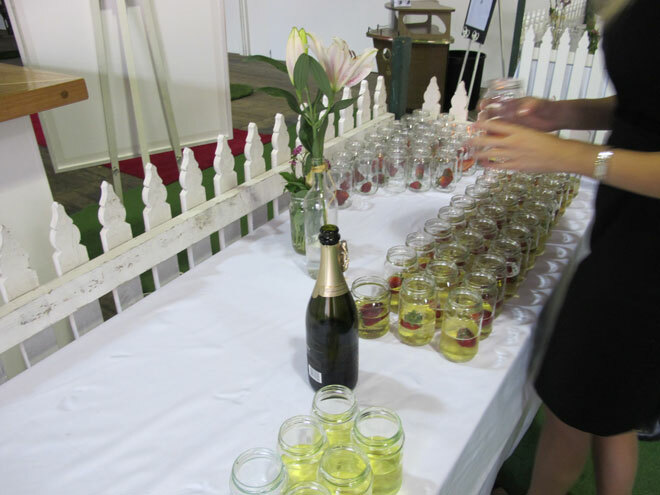 A great idea from Easey Streets is to have a white picket fence adorning the buffet tables, especially at the entrance to the event or on the champagne tables. Now the Melbourne Cup Day is a day to get dressed and be all fancy and enjoy the races – something many people consider a wealthier person to enjoy. Make sure the food you serve at your Melbourne Cup day event is more higher scale food than just pies and sausage rolls. Serve champagne and strawberries, macaroons, boutique beers, tea sandwiches and tiny cakes. Think High Tea, but with more horses! And don’t forget to make sure everyone dresses up in their fanciest of clothings (top hats, tails, suits, dresses, heels, fascinators, monocles, you name it!) and broadcast the 3.00pm race!